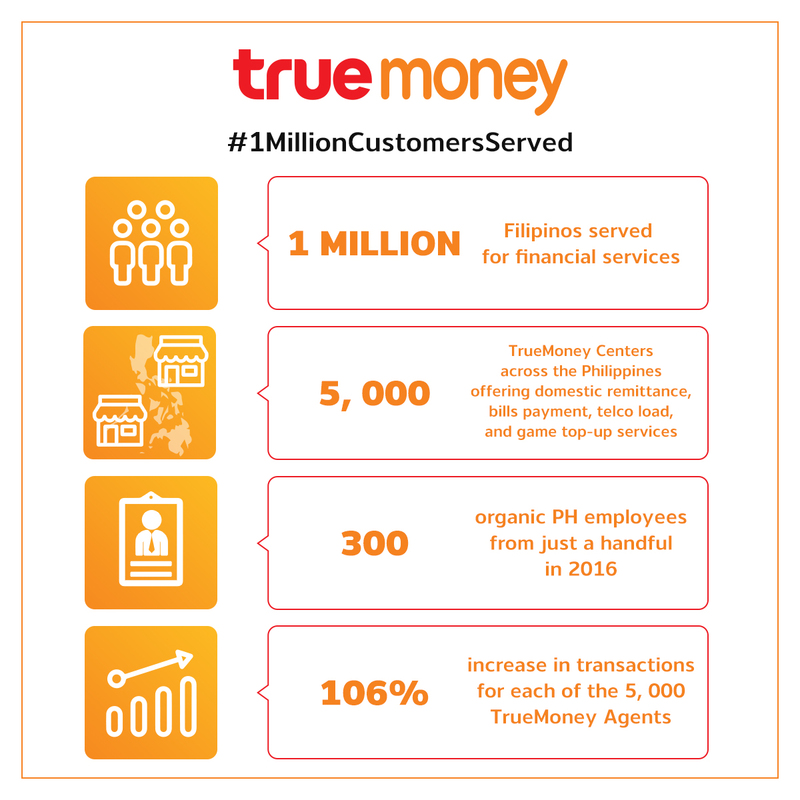 TrueMoney Philippines recently achieved one of their biggest milestones to date. In less than a year of operations in the country, the company already reached its 1 million transacting customer mark. TrueMoney is a Fintech brand of Ascend Money, a digital finance venture of the C.P. Group from Thailand, one of the largest diversified conglomerates in Asia, and Ant Financial (Alipay), the payments arm of e-commerce giant Alibaba Group. It wasn’t so long ago when TrueMoney Philippines was just a business concept on a set of PowerPoint slides. Within the first few months, TrueMoney Philippines grew its workforce from one person to hundreds of employees spread across several regions in the country. The team also launched its core technology system and began offering services on a pilot basis to several partners. In a few months’ time, it already built what is now one of the largest payment and remittance networks in the country, with over 5,000 TrueMoney Centers. Today, TrueMoney Philippines already provides services such as payment of e-commerce purchases, bills payment, buying of load and credits, and remittance to multiple provinces nationwide, including far flung areas in Albay, Bataan, Benguet, Bohol, Bukidnon, Cagayan de Oro, Camarines Sur, Cavite, Cebu, Davao, Ilocos, Isabela, Laguna, La Union, Metro Manila, Misamis Oriental, Nueva Ecija, Nueva Vizcaya, Pampanga, Pangasinan, Quezon, Rizal, Tarlac, and Zambales and more! With an empowered footprint of TrueMoney Centers in strategic corridors, TrueMoney introduced its Money Padala (remittance) service a few months ago. For TrueMoney’s Partner Agents, this meant a more diversified portfolio of services and a greater potential of earning higher income. 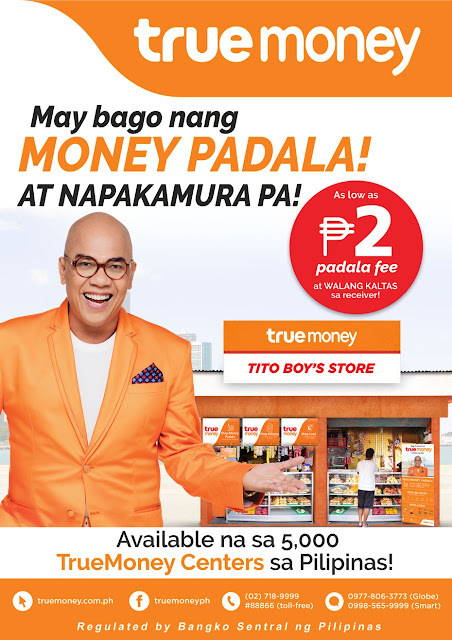 For its customers, it meant convenience and affordability as TrueMoney’s cash-to-cash Money Padala service is one of the lowest sending rates in the country. While the average rates for domestic remittances today range from 3 percent to more than 10 percent for some providers, TrueMoney rates go as low as only 2 percent of the transaction amount—without any additional charges to the recipient. So say for remittances of P1,000, the total cost of sending is only P20. The recipient also gets the entire amount without any additional charges. To reinforce its drive to serve the masses, TrueMoney has also worked with talk show host Boy Abunda in promoting the new brand in the Philippine market. To know more about TrueMoney and how to become a TrueMoney partner agent, visit www.truemoney.com.ph or call (02) 7189999. You may even text them at 09778063775 (Globe) or 0998565999 (Smart).